Tip my handbag upside down and you're probably going to be faced with at least 17 different lip products. I'm not quite sure how they build up so much but each week I have to have a good clear out and keep just a small handful in there. In those products there is ALWAYS a lip balm. I cannot go anywhere without one and I actually think my lip are a little bit dependant on them now - opps! When I heard the Burt's Bees were releasing a squeezable version of their original beeswax lip balm I knew I had to try it. I've used a few of there lip products before and although they were good at fighting off the dry and chapped problems they weren't overly moisturising or hydrating. This on the other hand is the complete opposite. The balm has a 100% natural formula. Containing Beeswax (duh) and Vitamin E this stuff is so much smoother and softer than the other versions and the slanted tip makes it super easy to apply. Unlike the previous products you can actually feel this on your lips like a gloss which I love plus it isn't sticky in the slightest. It also has a small zing of peppermint which is actually the best feature for me as it helps put me off snacking! I have been using this non-stop and can see already that it won't be long until I have to buy a replacement - my lips feel hydrated and moisturised creating the perfect base for all my summer shades! Burt's Bees squeezable lip balm is priced at £4.99 and you can find it right about... here! I purchased my first Berts Bees lip balm the other day and I really am quite impressed! Ooh I love the original so I may have to give this a go too! 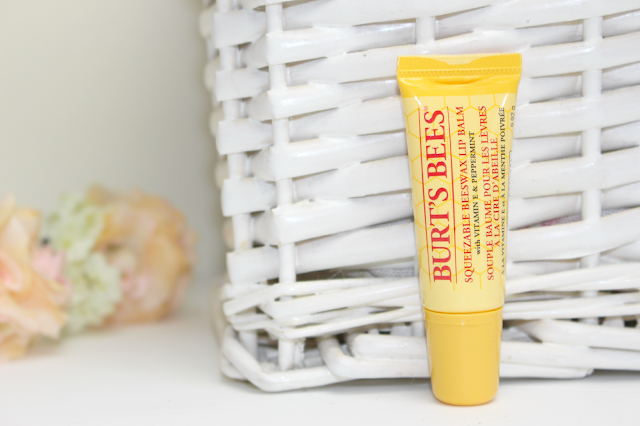 I love Burt's Bees lip balms, so I'll definitely end up picking this up at some point! Oooo I love the original so I'm excited to try it in squeezy form! I've never tried anything from Burt's Bees, but come Christmas I'm always dithering over their christmas sets! This year I vow to try something.